Border walls are being erected left and right as natural disasters become more frequent, leaving victims with nowhere to go. When I first talked to the three Honduran men in the train yard in the southern Mexican town of Tenosique, I had no idea that they were climate-change refugees. We were 20 miles from the border with Guatemala at a rail yard where Central American refugees often congregated to try to board La Bestia (“the Beast”), the nickname given to the infamous train that has proven so deadly for those traveling north toward the United States. The men hid momentarily as a Mexican army truck with masked, heavily armed soldiers drove by. Given Washington’s pressure on Mexico to fortify its southern border, US Border Patrol agents might have trained those very soldiers. As soon as they were gone, the Hondurans told me that they had been stuck here for six long days. The night before, they had tried to jump on La Bestia, but it was moving too fast. When I asked why they were heading for the United States, one responded simply, “No hubo lluvia.” (“There was no rain.”) In their community, without rain, there had been neither crops, nor a harvest, nor food for their families, an increasingly common phenomenon in Central America. In 2015, for instance, 400,000 people living in what has become Honduras’s “dry corridor” planted their seeds and waited for rain that never came. As in a number of other places on this planet in this century, what came instead was an extreme drought that stole their livelihoods. Talking with those farmers in the Tenosique train yard felt, in a way, like a scene from a sequel to the movie The Road in which a father and son walk across a post-apocalyptic North America devastated by an unknown cataclysm. In reality, though, I was just in a typical border zone of the Anthropocene, the proposed new geologic era characterized by human activity as the dominant force on the climate and environment. And these young, unarmed farmers with failing harvests are now facing the only welcome this planet presently has to offer for such victims of climate change: expanding border regimes of surveillance, razor-wire walls, guns, and incarceration centers. As they keep heading north, they will have to be on guard against ever more army and police patrols, while enduring hunger and thirst as well as painful separations from their families. They will have to evade endless roadside checkpoints, which Fray Tomás Tómas González Castillo, director of a nearby shelter for migrants in Tenosique, told me were almost “impossible” to avoid, at a time when, he noted, “organized crime” controls the trains. Such a predicament is hardly unique to the Mexico-Guatemalan border region or even the US-Mexican version of the same. Think of the maritime divide between North Africa and the European Union or the Jordanian border where patrols now reportedly shoot at “anything that moves” coming from Syria—or so a Jordanian official who prefers to remain anonymous told me. And Syria was just one of the places where the ever-increasing impacts of climate change, migration, and tightly enforced border zones intersected. Now homeland-security regimes are increasingly unleashing their wrath on the world’s growing numbers of displaced people, sharpening the divide between the secure and the dispossessed. Whether in Mexico or on the Mediterranean Sea, as ever more human beings find themselves uprooted from their homes and desperate, such dynamics will only intensify in the decades to come. In the process, the geopolitics and potentially the very geography of the globe will be reshaped. It’s not just Donald Trump. Everywhere on Planet Earth, we seem to be entering the era of the wall. Though the numbers are often debated, the United Nations High Commission for Refugees suggests that climate breakdowns will displace 250 million people by 2050. The Internal Displacement Monitoring Centre suggests that those numbers could actually range from 150 million to a staggering 350 million by that year. In reporting on how climate change is already affecting Mexico City, Michael Kimmelman, the architecture critic of The New York Times, cited a report suggesting that the number may be far higher than that, possibly reaching 700 million—and that, by 2050, 10 percent percent of all Mexicans between 15 and 65 might be heading north, thanks to rising temperatures, droughts, and floods. “Although the exact number of people that will be on the move by mid-century is uncertain,” wrote the authors of the report “In Search of Shelter: Mapping the Effects of Climate Change on Human Migration and Displacement,” “the scope and scale could vastly exceed anything that has occurred before.” And here’s the sad reality of our moment: For such developments, the world is remarkably unprepared. There isn’t even a legal framework for dealing with climate refugees, either in international law or the laws of specific countries. The only possible exception: New Zealand’s “special refugee visas” for small numbers of Pacific Islanders displaced by rising seas. I have no idea what happened to those three farmers after our brief meeting in Tenosique. I did, however, think of them again a couple of months later when I was 1,000 miles to the north. Under a mesquite tree in northern Mexico, there was a lonely plastic bottle with a few droplets of water still in it. Somebody had left it as they crossed into the United States. I was just east of Agua Prieta in the Mexican state of Sonora, a mere 25 feet from the US-Mexican border. I could clearly see the barrier there and a US Border Patrol agent in a green-striped truck looking back at me from the other side of the divide. Perhaps a quarter mile from where I stood, I could also spot an Integrated Fixed Tower, one of 52 new high-tech surveillance platforms built in the last two years in southern Arizona by the Israeli company Elbit Systems. Since that tower’s cameras are capable of spotting objects and people seven miles away, I had little doubt that agents in a nearby command-and-control center were watching me as well. There, they would also have had access to the video feeds from Predator B drones, once used on the battlefields of the Greater Middle East, but now flying surveillance missions in the skies above the border. There, too, the beeping alarms of thousands of motion sensors implanted throughout the US border zone would ring if you dared cross the international divide. Only 15 years ago, very little of this existed. Now the whole region—and most of this preceded Donald Trump’s election victory—has become a de facto war zone. Climate refugees, having made their way through the checkpoints and perils of Mexico, will now enter a land where people without papers are tracked in complex, high-tech electronic ways, hunted, arrested, incarcerated, and expelled, sometimes with unfathomable cruelty. To a border agent, the circumstances behind the flight of those three Honduran farmers would not matter. Only one thing would—not how or why you had come, but whether you were in the United States without the proper documentation. Climate change, increased global migration, and expanding border enforcement are three linked phenomena guaranteed to come to an explosive head in this century. In the United States, the annual budgets for border- and immigration-policing regimes have already skyrocketed from about $1.5 billion in the early 1990s to $20 billion in 2017, a number that represents the combined budgets of Customs and Border Protection (CBP) and Immigration and Customs Enforcement. 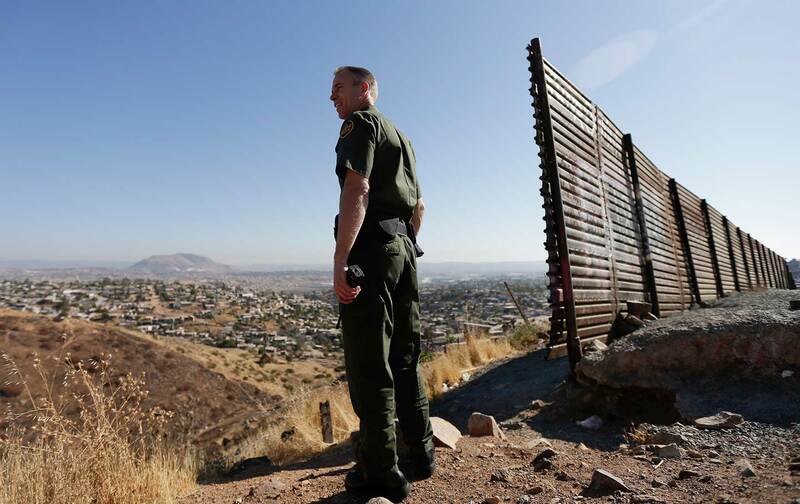 During that period, the number of Border Patrol agents quintupled, 700 miles of walls and barriers were constructed (long before Donald Trump began talking about his “big, fat, beautiful wall”), and billions of dollars of technology were deployed in the border region. Such massive border fortification isn’t just a US phenomenon. In 1988, when the Berlin Wall fell, there were 15 border walls in the world. Now, according to border scholar Elisabeth Vallet, there are 70. These walls generally have risen between the richer countries and the poorer ones, between those that have the heavier carbon footprints and those plunged into Parenti’s “catastrophic convergence” of political, economic, and ecological crises. This is true whether you’re talking about the Americas, Africa, the Middle East, or Asia. India is typical in constructing a steel wall along its lengthy border with Bangladesh, a country expected to have millions of displaced people in the decades to come, thanks to sea-level rise and storm surges. In these years, with so many people on the move from the embattled Greater Middle East and Africa, the countries of the European Union have also been doubling down on border protection, with enforcement budgets soaring to 50 times what they were in 2005. The trends are already clear: The world will be increasingly carved up into highly monitored border surveillance zones. Market projections show that global border and homeland-security industries are already booming across the planet. The worldwide security market is poised to nearly double between 2011 and 2022 (from $305 billion to $546 billion). And, not so surprisingly, a market geared to climate-related catastrophes is already on the verge of surpassing $150 billion. While the Trump administration is scrubbing government websites and policies clean of climate change, other parts of the government are still in the business of preparing for it, big-time, rather than denying its existence. At both the Pentagon and the Department of Homeland Security, global warming is seen as a “threat multiplier” that must be factored into any long-term planning—and that should surprise no one. After all, the future time frame of a national security planner can be as much as 30 years. It sometimes takes that long for a major weapons system to go “from the drawing board to the battlefield,” according to former Assistant Deputy Secretary of State Kurt Campbell, editor of “Climatic Cataclysm: The Foreign Policy and National Security Implications of Climate Change,” a 2008 report coordinated by the Center for a New American Security and the Center for Strategic and International Studies. In other words, you don’t have to turn to climate-change activists and experts like Bill McKibben or Naomi Klein to understand why those Central American droughts are getting worse and why those three Honduran men were in that train yard. All of this was predicted by the Department of Homeland Security. Those in the DHS, like those in the Pentagon, grasp what’s coming, and they’re going to meet it with what they know how to do best, what Donald Trump himself would approve of if he weren’t ignoring the potentially most devastating phenomenon on this planet: hardened enforced borders, big brother biometrics, and high-tech surveillance systems. In other words, they will face the victims of climate change with a man-made dystopia. Now, remember that water bottle under the mesquite tree near the US-Mexico border? I came across it while being taken on a tour by Juan Manuel Pérez, the project manager of Cuenca Los Ojos, an organization dedicated to the preservation and restoration of biological diversity along those same borderlands. I was there to see a water-harvesting project. But first, Pérez took me to a spot where a portion of a barrier wall the CBP had once built across this part of the border lay wrecked like some ancient archeological ruin. It had been swept into Mexican territory in 2014 by a deluge of water, as the remnants of Hurricane Odile lashed the washes of the Chiricahua Mountains in Eastern Arizona. Now, planet Earth was devouring the carcass of that former wall, those hundreds of pounds of metal. Three years after it was deposited here, that wall fragment was already partially covered with soil. Purple flowers sprouted from its crevasses. When I got close enough, I could see spiders hanging from their webs on it. If the rest of that $20 billion in border infrastructure were left alone, in the end this is what would happen to it. This is how the earth would welcome it back. From there, I could see where DHS had built a new barrier to replace the destroyed one. Near it, that same border-patrol vehicle was idling and that same surveillance tower stuck up in the distance, all part of a desperate attempt to keep that “catastrophic convergence” at bay, to keep the world of such hurricanes and the climate-change displaced who will go with it somehow walled off from the United States. Nearby, I also saw what Pérez told me were gabions—steel cages filled with rocks embedded in the nearby streambed on the Mexican side of the border. They were there, he explained to me, to slow down the rushing rainwaters during the summer monsoon season so the soil could drink them in and be replenished. Remarkably, they had done their job. In this parched territory, in the middle of a 15-year drought, the water table had risen 30 feet. It was, I said, a miracle. Native grasses were growing back, as were the desert willows. The rising water, no respecter of borders or border patrols, had similarly begun to replenish the aquifers on the Arizona side and water was appearing in places that hadn’t seen anything like this before. Mind you, national-security assessments stress that in Mexico and Central America water-scarcity issues will be a factor driving climate breakdowns and increased migration. That was certainly the case for those three Honduran farmers. Here, however, those gabions, embedded in the dry river, were bringing water back to places where it had become scarce. Remarkably, from my vantage point in that border landscape, the cages of rocks began to look like parts of some intricately carved stonewall. It was a strange illusion, and it made me think that in a world of the grimmest sorts of walls meant to turn back everyone and offer greetings to no one, perhaps this was the real “border wall” that people needed, that planet Earth needed, something that welcomed us to a better, not a desperately worse world. Todd MillerTwitterTodd Miller has written on border and immigration issues for The New York Times, Al Jazeera America, and the NACLA Report on the Americas. His new book, Storming the Wall: Climate Change, Migration, and Homeland Security has just been published by City Lights Books.